Thinking about getting a Keurig coffee maker but don’t know which Keurig to buy? I’m here to help. Here’s some info that will hopefully help you find the best model for your home. When you are finally ready to get a new brewer, know what you care about most. Is it a large water tank, programmable auto ON or space-saving design? This will help narrow down your choices. How much are you willing to spend is important as well. Best in 2019 is still K-55, while K-cafe is a great option for those who want the lastest model. If you want the latest, there’s a new Keurig K-Cafe. This model might not have programmable features, but it’s a first k-cup machine that can make the coffee and froth milk at the same time. 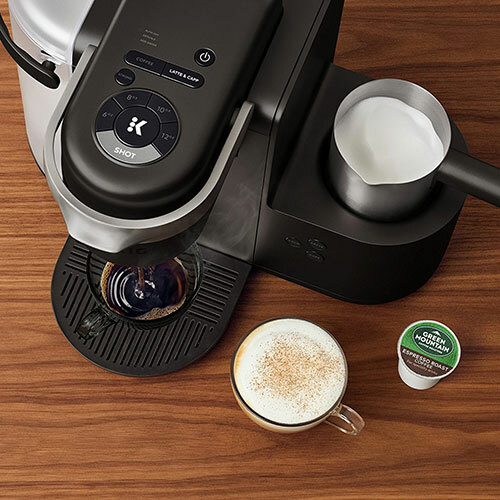 Keurig latte maker comes with a built-in milk frother and can do cold and hot froth so it easy to make regular lattes and iced lattes or cappuccinos. This model has 4 coffee sizes: 6, 8, 10 and 12, plus the Shot button (2 oz) for lattes. The machine also has a Strong brew option. The K-Cafe accepts all brands of k-cups and also works with reusable k-cup filter (read my Keurig K-Cafe review). Keurig K55 is a great option for people watching their budgets and those looking for a basic coffee maker. This coffee maker has 3 cup sizes and works with all k-cup brands. It’s a basic Keurig model and it’s always very popular because of its simplicity and its price ($89.99 on Amazon). Very similar to K55 is K-Select, but this model retails for $129.99. If you need a smaller Keurig, you have three choices: super-slim K-Mini Plus or the K200 which I don’t recommend because it works only with Keurig branded k-cups. There’s also a K-Compact model (available at Walmart and Amazon), but most of my readers were not satisfied with this model – apparently, everything smells like plastic and it makes really weak coffee. If you need programmable options, like you want to set up your machine to brew coffee in the morning or you want to be able to change the temperature of your drink, the K-Elite is the only model offering these features. This model retails for $169.99. Finally, if you want a coffee maker that uses k-cups but you want a different brand, the Bunn single cup coffee maker MCU is the best choice. It works with k-cups, but you can also use ground coffee, soft pods and tea bags. It’s versatile and it makes a really nice cup of coffee (and hot too!). The Bunn My Cafe MCU retails for $132.99. The water tank: Choosing the right reservoir size will make a huge difference. If you drink only one cup in the morning you really don’t need an extra large tank. If you have a huge family and you use at least 5-6 k-cups per day, waiting for a small tank to reheat the water each time can get annoying. Pod options: You want to get the machine that can brew all brands of k-cups so you’ll have more choices. There are some great (and cheap k-cups) on Amazon besides Keurig. Avoid Plus series (2.0 series) models because they work only with Keurig k-cups. Size: Keurig machines come in different shapes and sizes and you should choose the one that you know will fit your kitchen. K-Mini Plus is perfect for small spaces and K-Cafe can be a good choice for those who don’t lack counter space. 2018 has brought 3 new Keurig models, while most of their 2.0 models have been discontinued. 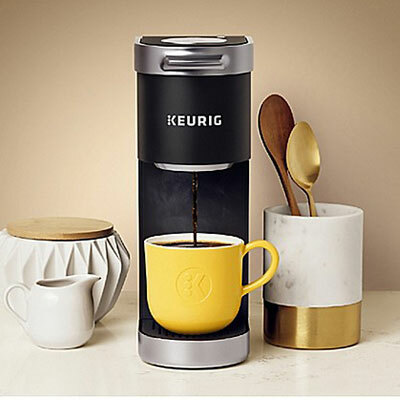 While you can still find some of these machines in stores and online, finding the pods or spare parts is not always easy so I recommend to avoid buying these: Keurig Rivo Cappuccino and Latte System, Keurig Vue, Keurig K300, K400 and K500 (also known as Plus series or 2.0 series) and old Keurig Mini with non-removable water tank. Despite the great k-cup models you can buy today, my advice for high-end buyers is to choose a machine that is built to last. While Keurig coffee makers are super popular, they usually don’t last as long as you would expect for the price. If you want to get a coffee maker that is built to last and makes a truly amazing coffee, Moccamaster is the best choice. It costs around $300 but this handcrafted coffee maker comes with a 5-year warranty, it really makes the best coffee and it’s available in a rainbow of colors. Here’s what else you need to know before buying a single cup brewer. When choosing a new coffee maker, you should also calculate how much it will cost to make a cup of coffee. While the k-cup machines offer convenience, the price per cup is higher than making coffee with a classic drip machine. One k-cup cost from $0.40 – $0.60, compared to $0.20 per cup when using ground coffee. If you want convenience and really cool features but you want a machine that uses ground coffee and not the pods, the Ninja System is a great alternative to Keurig. Read my Ninja Hot and Cold System review. If you want a capsule machine Nespesso Vertuoline is a great option – the pods are more expensive but everything else about this machine is great. A classic drip coffee maker is still one of the cheapest ways to make coffee at home. Here are a few of my favorite drip coffee makers. These coffee makers are plastic-free and toxin-free and they won’t allow mold and bacteria to grow.